As we still await bound copies of the second Bibliography . . .
. . . I have been preparing a little ‘present’ to be slipped into the first 250 copies to be sold. Early birds who ordered copies quickly of our first Bibliography ten years ago found (and, we gather, appreciated) a jeux d’esprit involving a piece of Frances’ paper, a couple of poems and some sheep! This time they will find the above. We have been fortunate to own that wood block by Eric Gill for many years. 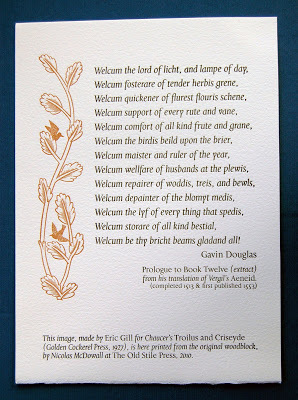 It gets an outing on special occasions (our daughter Cressida’s wedding invitation for example!) and this is a special occasion. For those who like to tot up monetary ‘value’ . . . as this is printed direct from the actual block, it means that this is an ‘original print’ by Eric Gill and so the book itself could be seen as coming more or less free! As soon as we receive copies (and I can photograph them), we will post final details of prices and ordering. It should not be too long now! Having been very inspired by your first Bibliography, I am very keen to read your second !